Turtle Island, Fiji, 6 September 2018 — Turtle Island Fiji is honored to be announced as ‘Fiji’s Leading Resort 2018’ by World Travel Awards (WTA). Asia and Australasia’s premium travel brands were unveiled at the World Travel Awards Asia & Australasia Gala Ceremony 2018. Hundreds of the leading figures from Asia and Australasia’s travel and tourism industries attended the red-carpet ceremony, which was staged at the InterContinental Grand Stanford Hong Kong on the 3rd of September. Awards are presented across three tiers: country, regional and world awards. The World Awards are the top tier of the WTA programme and features the most noteworthy winners from the regional tier. Furthermore, votes come from qualified executives working within travel and tourism and the consumer travel buyer. 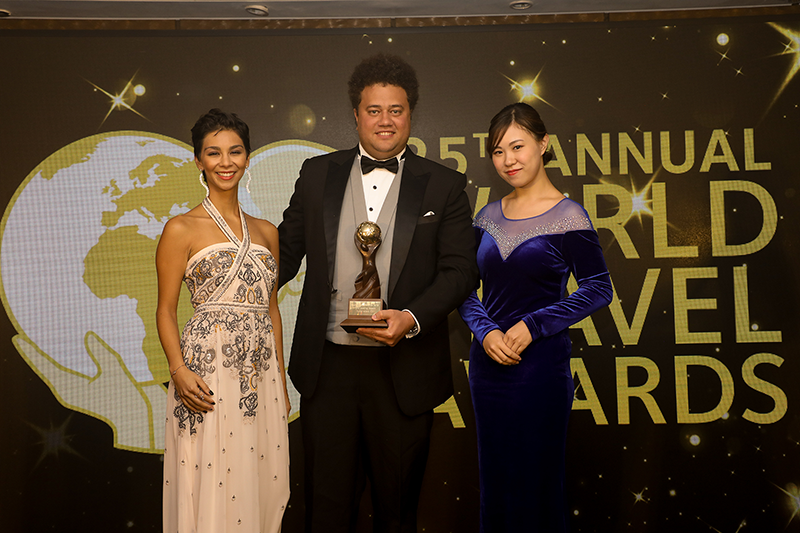 Richard Evanson Jr, Managing Director of Turtle Island Fiji, received the ‘Fiji’s Leading Resort’ award for Turtle Island. Evanson Jr said, “Collecting this award on behalf of Turtle Island was such an honor. I felt exceptionally proud to be representing all of our remarkable staff, our guests and of course my father whose vision shaped and created Turtle Island. This award reaffirms Turtle Island’s long-standing commitment to hosting guests with warm Fijian hospitality while providing an authentic and transformative experience”. Turtle Island is a cultural haven for the Fijian way of life. It is rooted in ancient values of respect, community, and joy. Turtle Island engulfs 500 acres of serene, white sand beaches and exquisite accommodations. Powered with solar energy and fueled with locally-grown produce. As a result, Turtle Island is simultaneously your conscious vacation getaway and second home. Touching every soul it shelters with its unique ability to encourage connection with oneself and one’s surroundings. With a maximum of 14 couples visiting the island at any given time serviced by a staff of 90, Turtle Island is a divine, long-standing example of the tranquility nature offers. And above all, our island showcases the innate connectedness we have with each other and the world. Learn more at http://turtleislandfiji.com.